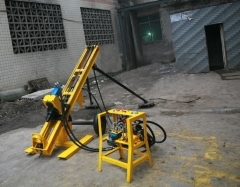 The simple up and down device can adjust the horizontal height of anchor cable hole easily. Wear resisting Nylon plate can prevent guide track from wearing when power head operates. 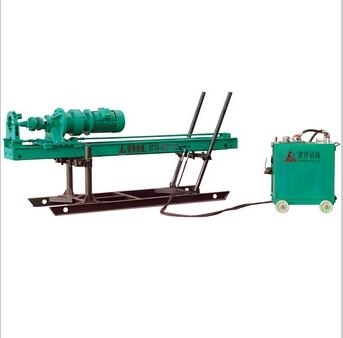 This device adopts hydro-cylinder and chain propulsion with compact structure, big lifting force and good stability. 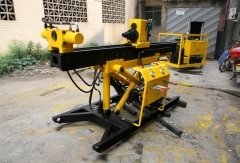 Electric operating and rock drilling work are both centralized controled. It is convenience and fast. The unidirection throttle valve can adjust feeding speed at any time. 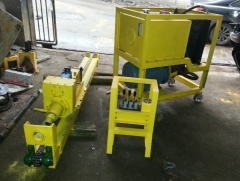 Propulsion reducing valve hand wheel can adjust propulsion force as per different working situation. Cycloidal gear reductor and electric motor forms power head. The power and torque transmit is stable and big. 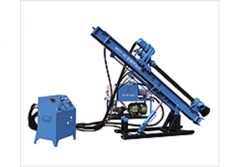 The air packet is the air source inlet of impactor, in the meanwhile it can reduce the impact of power head from drilling rod.